Interested companies can register online. 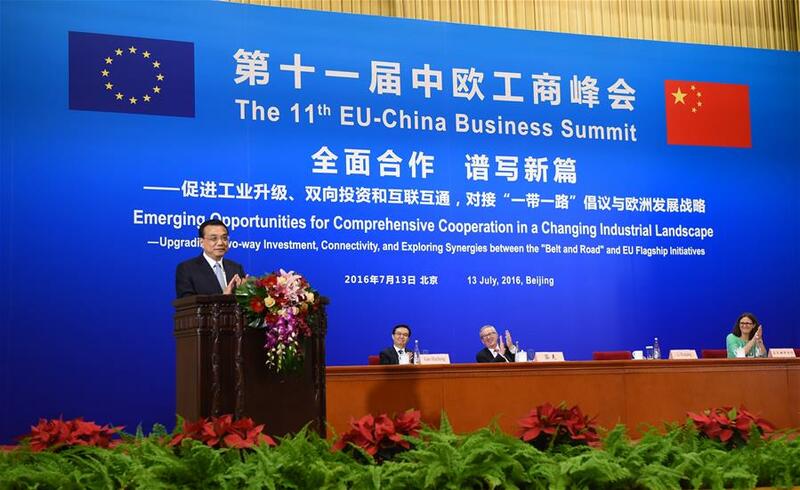 The 11th EU-China Business Summit was held on 13 July, 2016 at the Great Hall of the People in Beijing under the central theme of “Emerging Opportunities from a Changing Industrial Landscape”. Mr Philippe Van Der Donckt, Vice Chairman FCCC, and Mrs. Gwenn Sonck, Secretary General EUCBA and Executive Director FCCC, represented the EU-China Business Association (EUCBA) and the FCCC at the Summit. The EU-China Business Summit was jointly organized by the European Union Chamber of Commerce in China (European Chamber) and the China Council for the Promotion of International Trade (CCPIT), under the patronage of the European Commission and the Ministry of Commerce (MOFCOM), and with collaboration from the EU-China Business Association and BUSINESS EUROPE. The Business Summit was held in parallel with the Political Summit. EU and Chinese political leaders, the Premier of the People’s Republic of China, Li Keqiang, President of the European Council, Donald Tusk and President of the European Commission, Jean-Claude Junker joined the Political Leaders Plenary Session by delivering keynote speeches. This year’s summit gathered around 600 Chinese and European attendees, including Chinese Ministers and European and Chinese business leaders. Breakout sessions covered three key themes: New Industrial Revolution, Investment, and Connectivity, and featured senior representatives from both European and Chinese companies. China’s automobile exports tumbled in the first half of this year to 340,000 units, 10.8% fewer than in the first half of last year. Exports of vehicles, chassis and auto parts brought in a total of USD27 billion, a fall of 6.3% on last year’s figure. They dropped 5.6% year-on-year in June. Commercial vehicle exports slumped by 33.4% in the first half of the year to around 114,000 units, while passenger car exports dipped by 6.5% to about 200,000 units, according to the China Association of Automobile Manufacturers (CAAM). “If Chinese car makers can grasp a 20% to 30% share in the international market, then we can say the industry has matured,” said Deputy Secretary General of CAAM, Shi Jianhua. CAAM found that Latin America, Eastern Europe and Southeast Asia were the major automobile export destinations. Research by Deloitte Consulting showed that Iran was the leading destination for Chinese vehicles last year, accounting for 14% of the country’s auto exports, followed by 10% to Vietnam, and 5% to Egypt, Chile, and Venezuela respectively. Many Chinese carmakers opted to build factories abroad to reduce export costs due to the host countries’ import tariffs, non-tariff barriers, and drastic currency fluctuations, according to Deloitte. In contrast to the export situation, China’s domestic market achieved higher than expected growth for both June and the first half of the year. However, CAAM maintained its 6% annual growth rate prediction for market volume this year. Nationwide, vehicle deliveries jumped 8.14% year-on-year to 12.8 million units from January to June, and this was accompanied by a 9.23% rise in the volume of passenger car sales to 11 million units, the China Daily reports. China is planning to set up its first immigration office under the Ministry of Public Security before the end of the year. It would be created by merging and expanding the Ministry’s border control and entry-exit administration bureaus. Further details are still sketchy, but the move points to the importance of foreign talent recruitment in China. The central government released a document on foreigners’ permanent residency in February that said it “will further improve the organizational setting and the delegation of responsibility of immigration affairs, and place the functions of drafting permanent residency policies, review, approval and daily service under a single agency”. Wang Huiyao, President of the Center for China and Globalization, said that “Foreign talent is important to help promote innovation and the setting up of new businesses. In the United States, one-third of patent holders, nearly half the founders or co-founders of its top 50 listed corporations and nearly half its doctoral degree holders in science and engineering are immigrants.” About 600,000 foreigners work in China, a tiny proportion compared to the country’s 1.3 billion people. By contrast, in major international cities, immigrants account for 20% to 80% of the population, according to the International Organization for Migration (IOM). Wang said an immigration bureau should integrate responsibilities that are now scattered throughout many government departments, the China Daily reports. On 13 July 2016, the State Administration of Taxation (SAT) finally released the long-awaited Bulletin 42 to revise the transfer pricing documentation requirements under Circular 2. By introducing the key recommendations under Action Plan 13 of the Base Erosion and Profit Shifting (BEPS) Project, Bulletin 42 will have a far-reaching impact on taxpayers. In its latest alert, the China Tax Group of Baker & McKenzie will first look at who is affected by Bulletin 42. it will then discuss key provisions introduced under this bulletin and their implications on multinational companies (MNCs). Finally, it will provide some recommendations to MNCs on how to ensure compliance with the new transfer pricing documentation requirements and how to develop appropriate strategies to safeguard their tax interests in China.